Outside of the construction industry, light towers are used in military, oil and gas, industrial and mining sectors. They are applied to support security and perimeter lighting systems, illuminate remote areas with high activity, and guide workers entering or leaving the target location. This article covers the difference between two types of light towers: mega LED light towers and metal halide light towers. There are several types of light towers that businesses can use for illumination in construction sites. A portable light tower is a compact light tower that can reach a maximum height of 10 feet, and can easily be setup by one person. This light tower variant uses an external power source, and is transportable via car or truck. A mobile light tower is a large lighting system that is used to illuminate wide target areas for long periods of time. Instead of external power sources, such towers carry their own power generation components- diesel or gas engines, solar generators or battery packs. It can reach heights up to 25 feet; and most models incorporate multiple lamps for comprehensive illumination, sometimes up to 12 units. 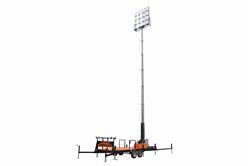 Most mobile light towers use metal halide technology for light output. Lastly, a mega light tower is a larger version of a mobile light tower. When fully deployed, it can reach heights up to 50 feet. Such units are designed for heavy lighting requirements, and support protection against extreme temperature and weather conditions. Light production is a key difference between LEDs and metal halide lamps. The latter, also known as high-intensity discharge lamps, utilizes an arc or discharge tube that is made out of quartz or ceramic material. Inside the tube, mercury, metal halide salts and argon (as a starting gas) are present. The halide salts can further be broken down into the following components: silver chloride (AgCl), sliver fluoride (AgF), silver bromide (AgBr) and silver iodide (Agl). During operation, the ballast administers a high voltage to the starting electrode, activating the argon particles. This activity creates heat and pressure, causing mercury inside the tube to vaporize. It is important to consider that the ballast is also responsible for regulating the lamp’s operating current, in addition to the starting current. Borosilicate glass is the material typically used to manufacture metal halide bulbs. It is designed to provide a consistent thermal environment for the discharge tube, which prevents its internal components from oxidizing, as the lamp meets the temperature requirements of the halide salts, ranging between 1,000-3,000 degrees Celsius. The glass material also minimizes UV radiation levels during light output. Around 75 percent of the energy produced by the luminary is turned into heat, while the remaining 25 percent is converted into actual light. The initial warmup process takes around five to 15 minutes, depending on the type of metal halide fixture. The lights are also subject to cool-down periods ranging between 15 minutes to 45 minutes when toggling an operational unit off and on. For construction sites, this could cause delays when the tower needs to be restarted, or moved to a different location. LEDs produce light through a process called electroluminescence using semiconductor components. As various electrons move through the semiconductor, light is created. Heat loss also occurs, but on a minimal level. During output, the LEDs do not rely on reflectors to direct light to the target area. By comparison, metal halide lamps use reflectors to prevent the loss of light and increase radiation to the target location. Moreover, LEDs can reach maximum light output almost instantly, and operators can toggle an operating light off and on without succumbing to a cool-down period. LEDs do not use glass in their design, and a ballast is not required for light generation. With an average lifespan of 10,000+ hours, metal halide lamps are subject to more maintenance work, compared to LEDs, which support a robust average lifespan of 50,000+ hours. During application on construction sites, the fixtures are regularly exposed to unpredictable elements, such as rain, vibration, power surges and impacts. This can negatively affect the general lifespan of the luminaries, causing them to depreciate considerably. However, out of the two options, LEDs, with their solid state design that resembles a tight circuit board, can tolerate rough treatment better their metal halide counterparts. The latter is filled with loose filaments and parts that are sensitive to unforgiving outdoor environments. When it comes to specific parts of the unit, the rate at which components in metal halide lamps fail includes the following: lamp- 80 percent, ballast (power supply)- 10 percent, housing- five percent and controls- five percent. For LEDs, the failure rates of components include the following: driver (power supply)- 52 percent, housing- 31 percent, LED package- 10 percent and driver (control circuit)- seven percent. How a worker conducts maintenance work on the lamps greatly varies between the units. For example, when addressing an LED’s multiple drivers and banks with failsafe protection, operators are not required to replace each part individually. This is because when an LED bank fails, the other LED banks continue to operate normally. When one of an LED’s multiple drivers fail, only part (usually half) of the lights stop operating. This can reduce the need to perform constant maintenance work on the light tower. A major risk that comes with maintaining metal halide towers is exposure to hazardous chemicals. As mentioned earlier, the units rely on mercury for light production. When repairing broken bulbs or lamps, workers must take extra precautionary measures to prevent unwanted exposure. This can be difficult with a light tower, because of their inaccessible features (high locations). LEDs do not utilize dangerous chemicals during light output, and workers are able to handle the lights quickly and confidently during maintenance.